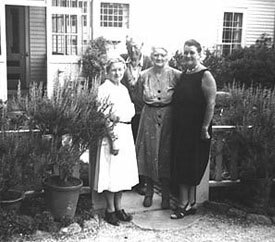 Garland Farm was the ancestral home of Lewis Garland, Beatrix Farrand’s property manager at Reef Point. The original homestead consisted of an early 19th-century farmhouse, dairy barn, garage, and about 100 acres of fields and woods running down to the shore. Amy Magdalene Garland, who married Lewis Garland while at Reef Point, was Beatrix Farrand’s horticulturist and friend. Due to her failure to find an administrative gardener after Mrs. Garland’s imminent retirement, mounting costs, and the changing character of Bar Harbor after the fire in 1947, Farrand decided to dismantle Reef Point . In 1955 she joined the Garlands in their move to Garland Farm. 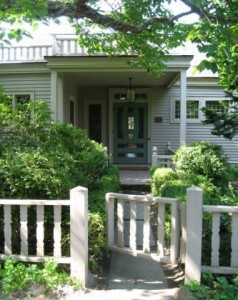 Before the move, however, she gave her library and collections to the University of California at Berkeley, and after dispersing unwanted furniture and personal items, she tore down the old house, salvaging materials, such as the front door and interior cabinetwork, which she brought with her to Garland Farm. Thanks to the intervention of Charles Kenneth Savage, a local landscape designer, and John D. Rockefeller, Jr., many of the plants at Reef Point were removed to Asticou Azalea Garden and Thuya Lodge Garden in Northeast Harbor. Farrand engaged the architect Robert Patterson to design an addition between the farmhouse and the barn where she would live with Clementine Walter, her companion and caregiver. 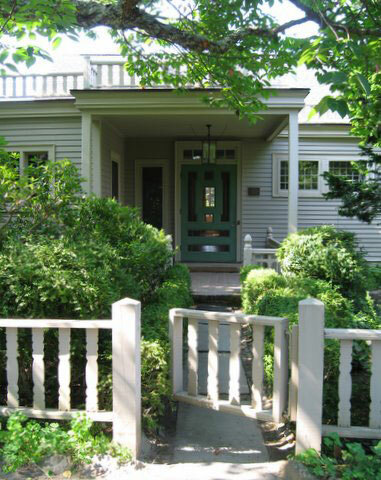 Patterson was able to reuse many architectural elements from Reef Point, such as the French doors, floorboards, windows, moldings, railings, light fixtures, and hardware. The floor plan consisted of two main sitting rooms with bathrooms, a study, entrance hall, kitchen, and storage rooms. The two suites and the study faced a new terrace garden, with French doors opening out into two separate garden spaces, one for Beatrix and one for Clementine. After Farrand’s death in 1959, the Garlands continued to live there until Amy Garland, then an elderly widow, moved elsewhere. The property was sold to Jerome and Helena Goff in 1970 and in 1993 it was sold to the Eveland family. At the time of Virginia Eveland’s death in October 2002, the size of the original property had been reduced to 4.9 acres, including the house, barn, garage, and a small greenhouse. In 2002 a number of individuals and groups joined forces to find a private or institutional owner who could honor Farrand’s unique legacy. The Beatrix Farrand Society was incorporated under the leadership of James and Emily Fuchs for the purpose of purchasing the property. After successful fundraising, Garland Farm was purchased from the Eveland estate in January 2004. 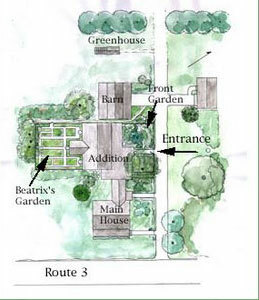 Since that time the BFS has set a mission of restoring Garland Farm to its Farrand-era design and condition and instituting a design and horticultural study center there. 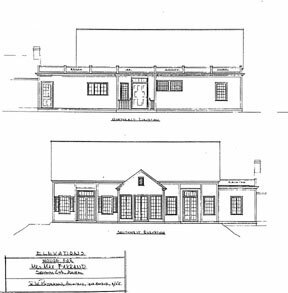 Garland Farm is now listed on the National Register of Historic Places.